Mississauga Celebration square is the premier location for free outdoor events, connecting residents and community groups through arts, culture, and heritage. Located in the heart of downtown Mississauga, across from Square One Shopping Mall, Celebration Square boasts a main stage with a state-of-the-art sound and lighting system, two digital program screens, a lawn and an interactive water feature. 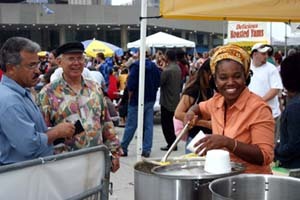 Food and craft booths are available at Mississauga Celebration Square for two days (Saturday, July 11 & Sunday July 12, 2015). Fort York is a historic site of military fortifications and related buildings on the west side of downtown Toronto, Ontario, Canada. The Fort was established in 1793 to defend the City of York (Toronto) from the threat of military attack from the United States during the War of 1812. Today, the City of Toronto operates Fort York as a historic site museum. The site is also used to host a number of summer events. IRIE Music Festival will take place at the Fort York Garrison Common for two days. Food and craft vendor booths will be available at Fort York on Saturday, August 1st and Sunday, August 2nd, 2015. Please call our office at 905-799-1630 x 28 for our vendor rates and availability or send an e-mail to vendors@iriemusicfestival.com.